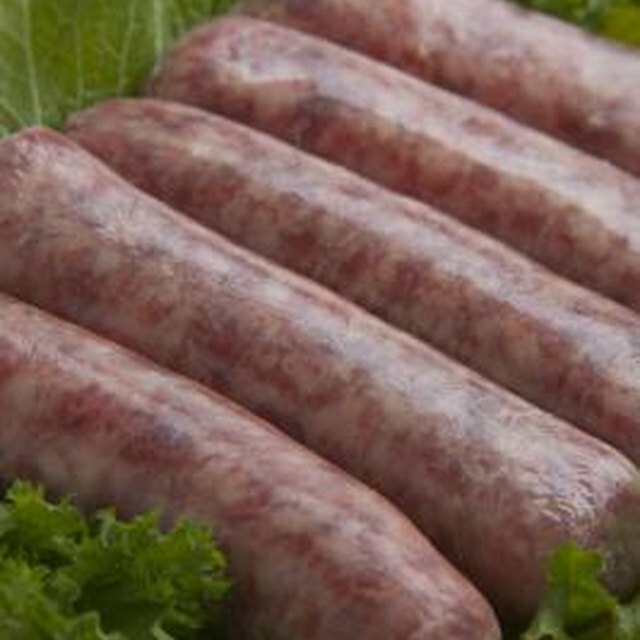 Smoky, savory deer meat sausage, or venison sausage, is a delicacy that is typically only available if you know a hunter who makes his own sausage or if you live in an area that sells the processed meat. If you do find venison sausage, grill it slowly and at a low temperature to prevent the lean meat from drying out in the casing. If you cook it correctly, your venison sausage will be tender and juicy. Preheat the grill to medium-high, or 400 degrees Fahrenheit. Brush 1/8 cup of olive oil on the grill grates to prevent the venison sausages from sticking. Brush the remaining 1/8 cup of olive oil on the venison sausages. The oil will make the skin crispy, as well as prevent them from drying out and splitting. Place the venison sausages on the grill and cook for five minutes, turning them once. Grilling them on medium-high for five minutes browns the outsides of the sausages, sealing in the juices. Reduce the heat to medium-low, or 300 degrees Fahrenheit. Close the lid and continue grilling the sausages for 15 to 20 minutes. Take one sausage off the grill and insert an instant-read thermometer into one end. When the sausage registers 160 degrees Fahrenheit, it is done. Take the sausages off the grill and allow them to rest for five minutes. This resting period allows the meat inside the sausages to cool slightly, which will allow it ti absorb the hot juices in the sausages. The sausages will be more juicy as a result.